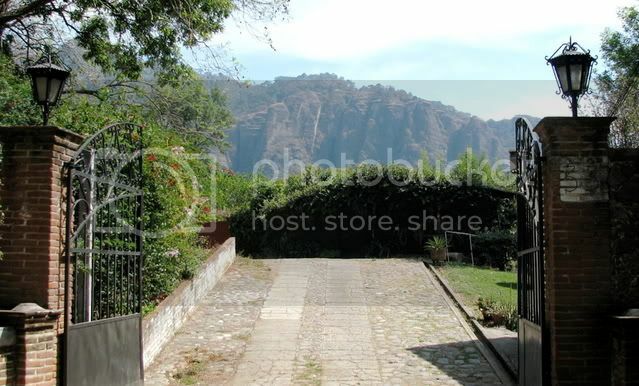 TEPOZTLAN, Morelos--This dramatic entryway greets some lucky homeowner here. Tepoztlan is just south of Mexico City and is a popular weekend destination for Chilangos (Mexico City residents) who want to leave the hustle and bustle of the megalopolis behind. Jeremy and I treated ourselves to a Valentine's weekend here, and then didn't want to leave. Officially recognized as a "Magic Town," Tepoztlan overflows with charm. An Aztec pyramid in honor of an ancient **Pulque god towers over the city on the mountainside. **check out Jeremy's story about pulque by clicking on the blog title "Welcome"
TEPOZTLAN, Morelos-- Another beautiful entryway--this time to a church and convent here. 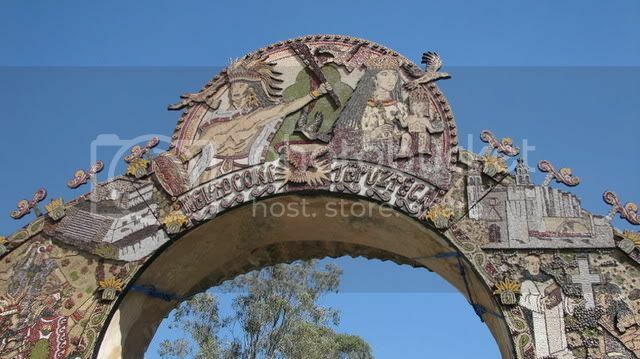 Locals build an archway beaded with seeds for this entrance every year. Ooooh. I want to see more photos! Hi there, I love the new format - the pics are great - and the commentary. You should join that blog whatever - you know the one that made J #1 He needs more competition. I'm so glad that you get to take so many trips for stories. You do know Mexico.